A small Crusaders post east of the Atlit fortress. It was built as a police station in the beginning of the 12th Century to protect the pilgrimage road from Acre to Jerusalem. 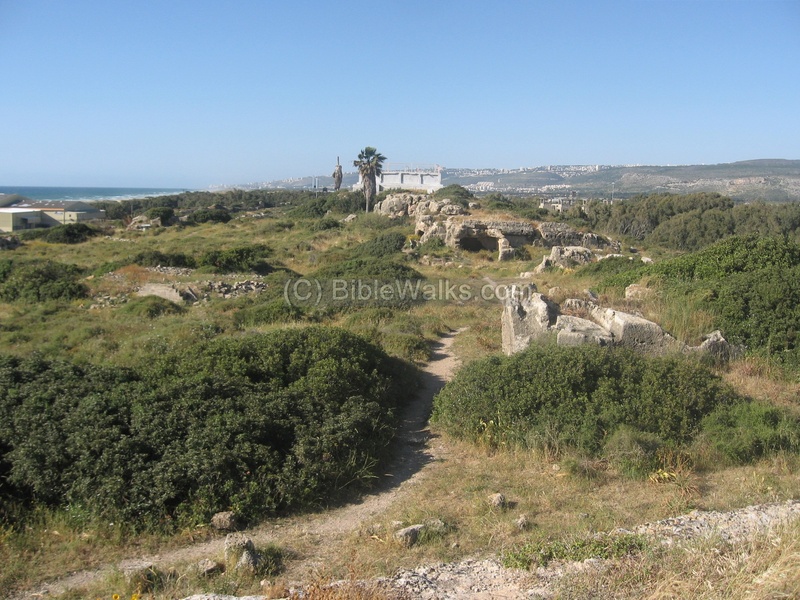 The site is located 20KM south of Haifa, on the sea shore, 3 KM west of Mount Carmel and 1KM east to the Atlit Crusaders castle. It is a small Crusaders post on the ridge of the sandstone hills. The Crusaders built this small post (21M x 18M x 3m Height), called Dustrey (also named Qarta). It was commissioned by the knights of the Templar order, whose mission was to protect the pilgrims in the Holy Land. The post, a sort of police station, was built in 1118. Its location is adjacent to the ancient north-south road. Its was quarried out into the sandstone (KurKar) ridge. The post was used to deter the robbers and road pirates that attacked the pilgrims, and was built after the Crusader's King Baldwin I was nearly killed at this place by robbers in 1102. The larger Crusaders fortress of Atlit, located on the bay of Atlit, was constructed later - in 1218-1220 AD, and included a large port. The Qrta post became part of the first line of defense of the fortress. This defense line extended for several KM south, along the sandstone ridge that runs parallel to the sea. An aerial view of the area is seen here, as viewed from the north side of Qarta. 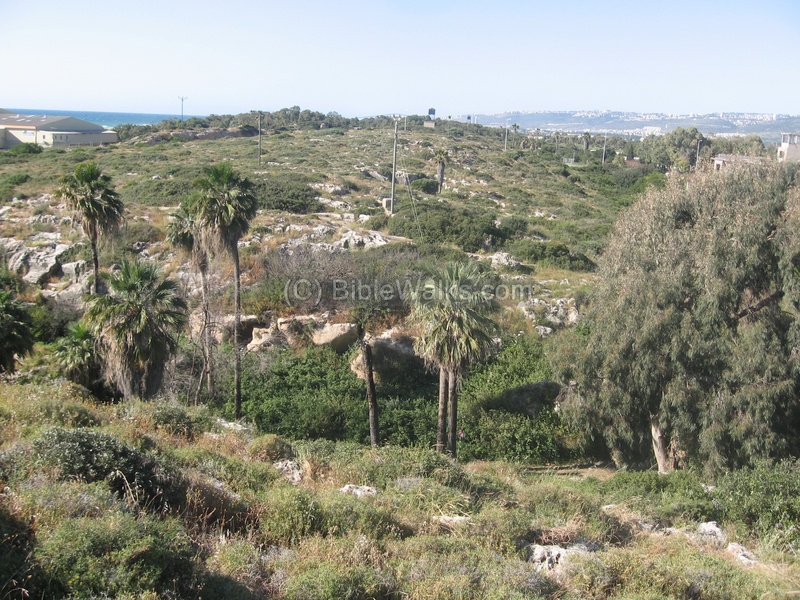 In the far left background is Mt Carmel, with the city of Atlit in the far left corner. The Oren creek flows in the Dustrey pass seen on the bottom of the view. This view is dated March 2018, with the new housing buildings constructed along the sandstone ridge. The Crusaders built in the center of the hill a small post (21M x 18M x 3m Height), called Dustrey (also named Qarta). 1. View from the south side. 2. View from the north side. 3. View from the west side. Behind the bush is a diagonal groove, used to drain the water into the cistern. The vertical shaft was used to access the water cistern from the top of the post. This aerial view shows the post from above, looking towards the east. The following photo is a view from the top of the 3M high post, looking east towards the foothills of the Carmel. In the background is the Oren creek on the far left side, and Ein-Hod - the artist village - in the background center. On the far right are the houses of the new suburb of the modern city of Atlit, which expanded in recent years all the way north to a close proximity of the site. 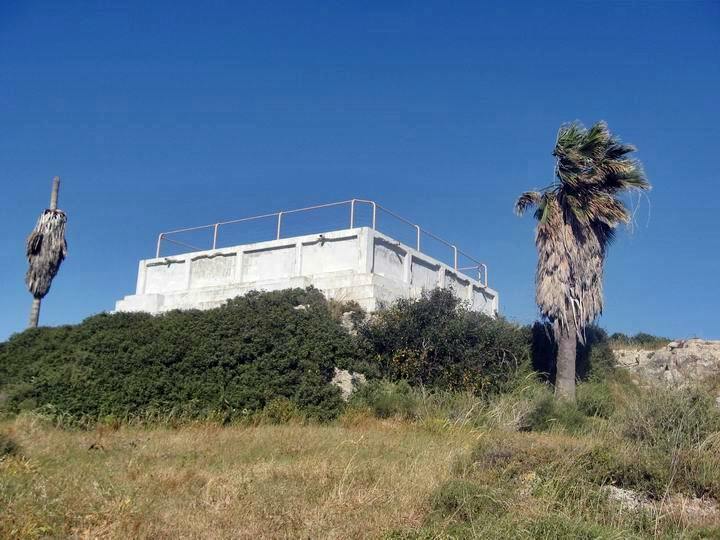 The top of the post is a sort of a balcony, and was an observation tower used to watch out for robbers approaching the coastal road. The balcony is the roof of the post, and is carved from the local sandstone - with addition of rocks held together with cement. 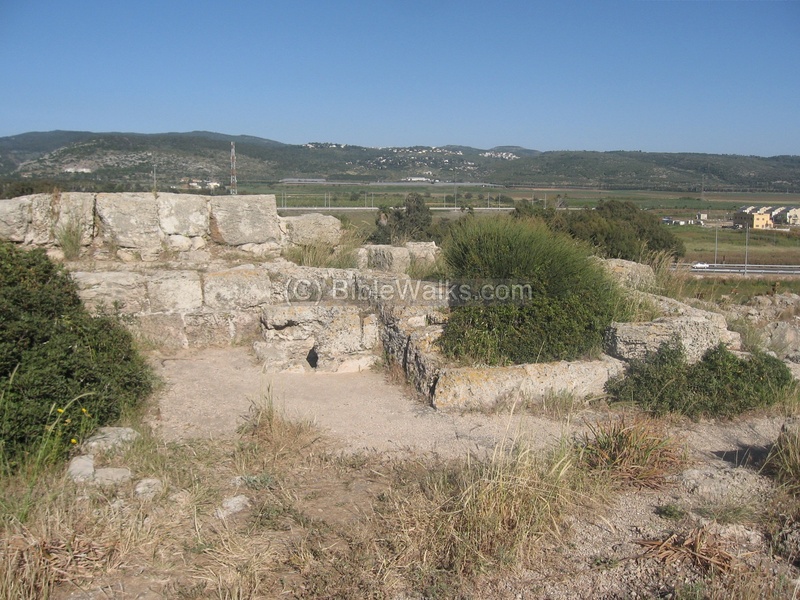 On the eastern side, seen below, the floor is made of large stone tiles (5x5M) which covered the water cistern. The photo below is the view from the post, looking north. On the left background is the Mediterranean sea. On the right background is mount Carmel and Haifa. In the center background is a water reservoir. Before the reservoir are the north rock-cut horses stables. On the left side is an area of a quarry which was probably used to supply stones for the building of the Atlit fort. A closer detail of the south side of the post. The small holes cut into the rock were used to hold the wood poles that were part of a roof. The large diagonal groove was part of the water cistern system, so the winter rains were collected from the rooftop and used to supply water for the guards throughout the year. This is the area north of the post, seen in the photo below in the near background. Behind the post is the modern city of Atlit, which is located 1-2KM south to the site. In the near foreground is a set of caves with horses stables. The following photo shows the west side of the set of caves, with the horses stables cut into the rock. The horses were used by the knights and soldiers to protect the area. 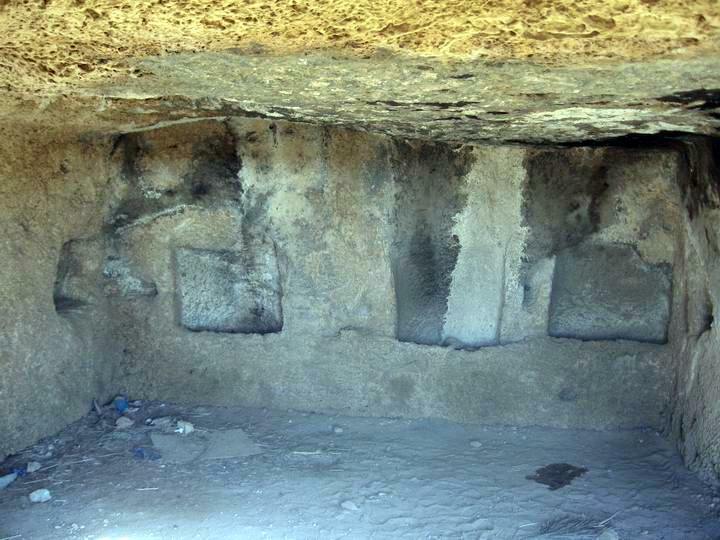 The following photo shows the insides of the cave, a rock-cut stables. The horses were tied to the wall, using holes cut into the wall, and the hay and water was laid in the rock cut holes. 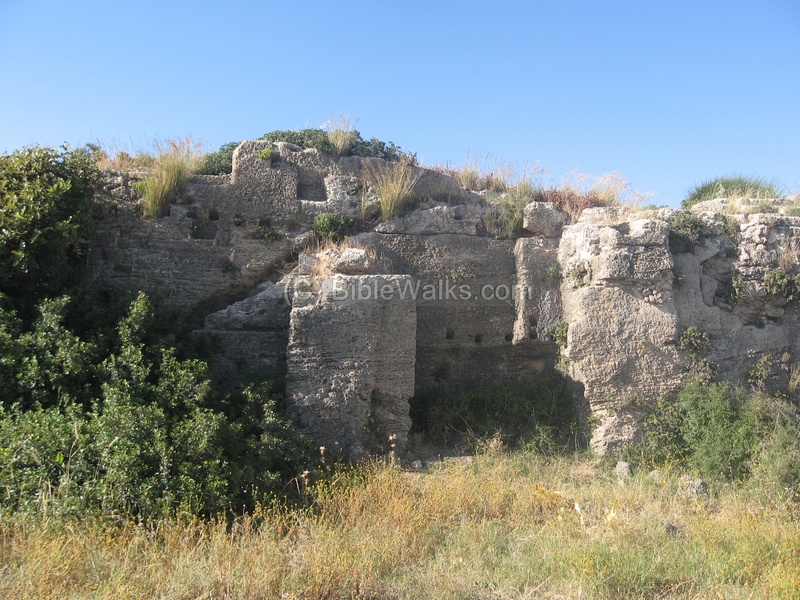 Walking south from the post, there is a trail that leads to Bab el-Ajel pass that was used to access the Atlit fort. The trail passes through the guards' post and south stables. 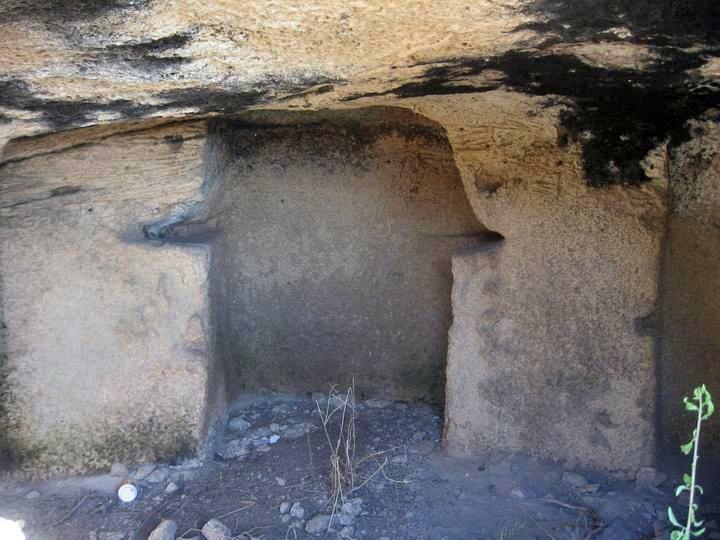 It is also cut into the rock, as seen on the photo below which is the west side. This is the insides of the south stables. Another view of the guard's post and the south stables. 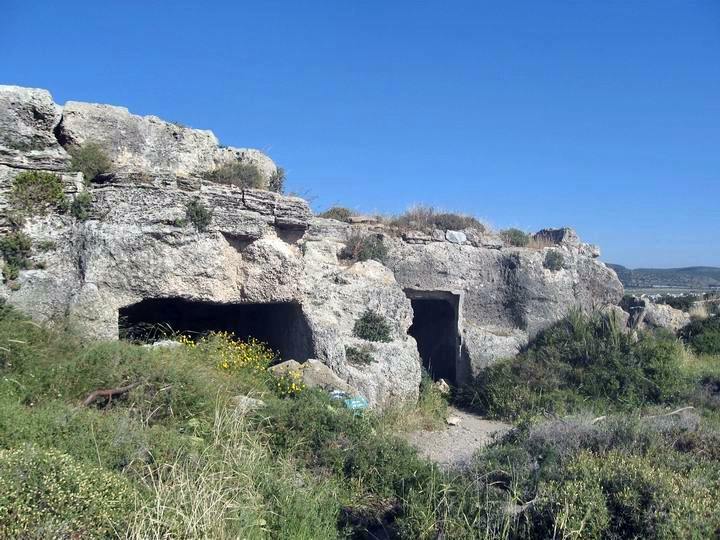 On the right background is another set of stables, and two holes are seen cut into the rock. This is the Bab el-Ajel pass, south to the Dustrey post. The narrow pass was used as an access to the Atlit fort. A vertical stone is seen in the south side, perhaps a milestone or ancient sign. There is a pass through the sandstone ridge 200M north to the Qarta site. A ground view is seen in the photo below, as observed from the south. The pass was cut out in ancient times (Roman? 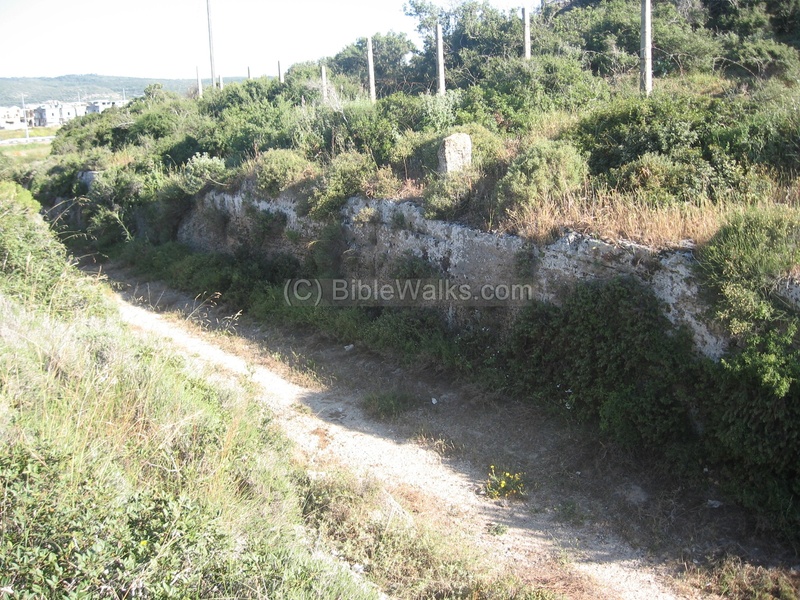 ), in order to drain out the swampy area between the ridge and the foothills of the Carmel. Oren creek, one of the major basins in the west sides of the Carmel, flows out the mountain 2.5KM east to this site, and the narrow pass lets the creek to flow out to the Med sea. This aerial view (dated March 2018) shows the pass from the north west side, with mount Carmel in the far background. Just above the pass is a water reservoir, which was pumped from the springs near the pass. On top of the reservoir is a balcony with a great panoramic view of the area. It is recommended to climb up to the balcony via the rock-cut stones. The trail starts at the park on the east side of the pass,. Another remarkable view near the Dustrey pass is a double row of palm trees (of the type "Washingtonia Robusta"). Theses trees were planted by Aaronson, who established in 1912 an agriculture research farm 1.5KM to the east. The farm, located at the edge of the row of palm trees, helped to develop the modern agriculture in the newly developed state. 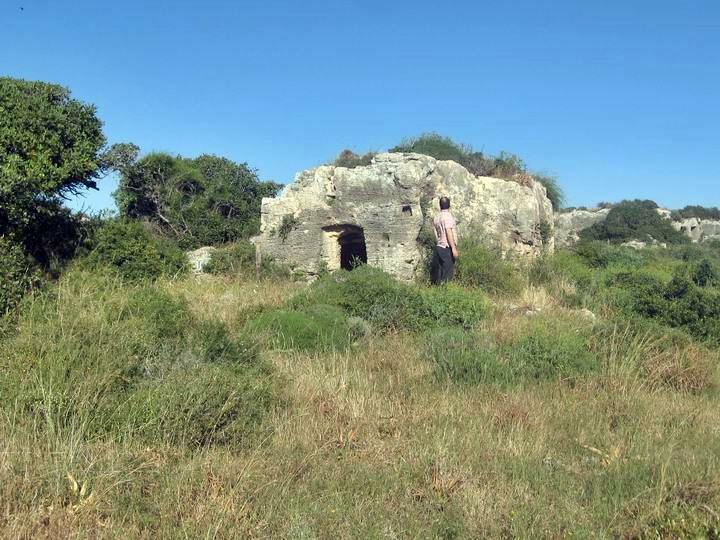 The place was abandoned in 1917 after the Turks executed and expelled some of its workers who played a role in assisting the British to conquer the Holy Land in WW1. Today the site is a youth camp. Sadly, some of the 100 year old tall palm trees were cut down last year by land developers who are very aggressive around this area. 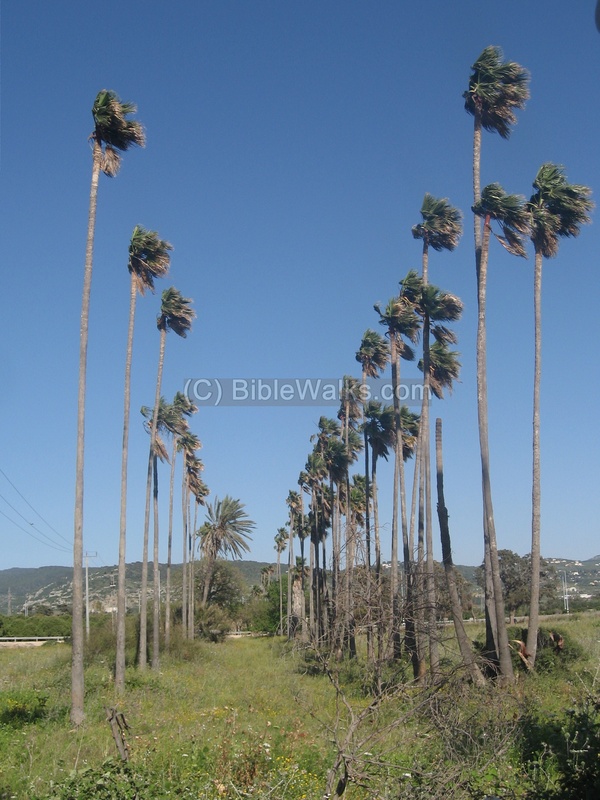 (Webmaster Rotem: My uncle, Amnon, managed to save most of the trees by standing before the bulldozers). 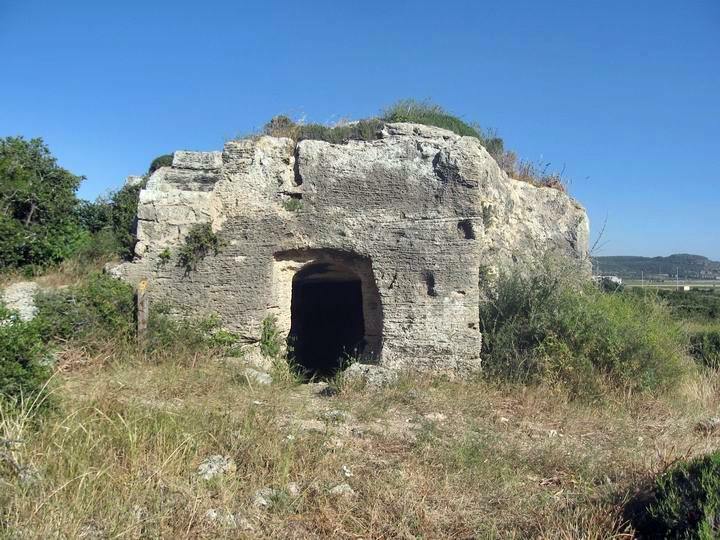 To visit the Dustrey fortress, leave your car at the park which is southwest of the Atlit junction. You can even have a picnic at the park facilities. Walk up the trail near the Dustrey pass. Follow it up to the water reservoir, and enjoy the panorama. 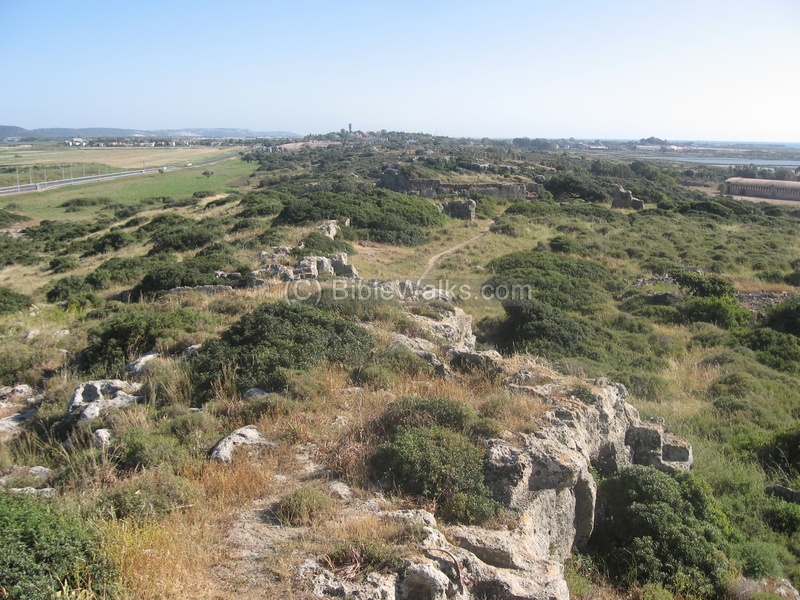 Then, walk south to the fortress, and climb up the stone fortress. After enjoying the sight, walk south to the stone gate. Walk eastwards through the Bab el-Ajel pass, then walk north, passing by the Phoenician letters. 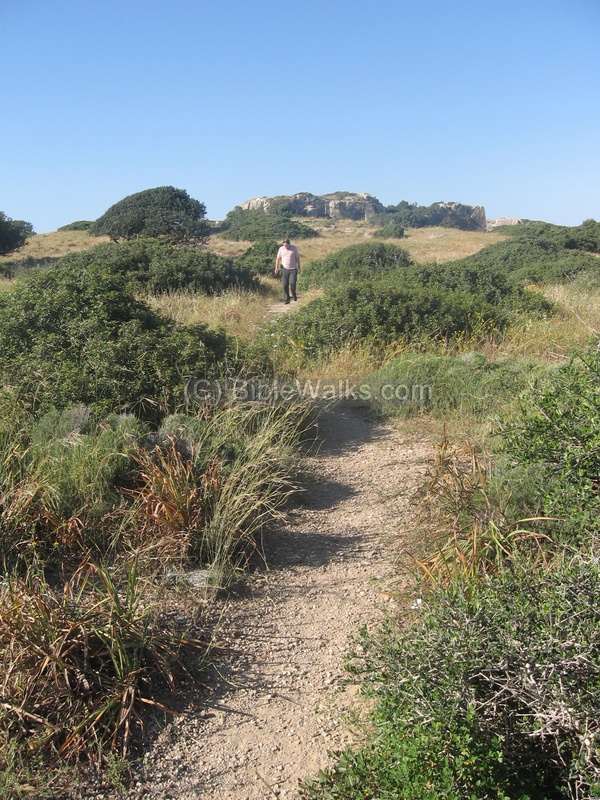 This is an easy 45 minutes walk and is highly recommended for families who look for hikes that combine history and nature. Arch. Survey of Israel - Atlit Map (24) - A. Ronen, Y. Olami  , site: #87 (H. Qarta). Dustrey - From French: La Destroit, districtum - a narrow passage. This name was due to the narrow passage cut into the rock, letting the Oren creek flow through the blocking sandstone ridge. The passage, cut probably in the Roman times, dredged out the waters from the swamps east to the site.